Last week the Jewish Federations of North America launched a major new marketing and advertising campaign called "What's Your #ish?" The idea was to get young Jews who use social media sites like Facebook, Twitter, and YouTube to proclaim their Jewishness in unique ways, and to collect all of these interpretations of what it means to be Jewish into a comprehensive list. The campaign asks Jews aged 19 to 36, to express what makes them Jew-“ish” via Twitter, Facebook or YouTube in an attempt to raise their awareness about Jewish federations. When they do so, they are asked to use the hashtag “#ish,” which automatically puts their submission in a Twitter trending feed that puts all submissions with the hashtag in one stream, and automatically puts their submissions on a Website the JFNA set up, whatsyourish.com. Here’s the problem, as was first pointed out by a commenter on Jewcy.com: “Ish” is also urban for the word [s--t]. According to the online Urban Dictionary, that is because many rappers started using the term “ish” instead of the more well-known four letter word in order to get around censorship regulations for radio play. Given the urban meaning, the hashtag #ish has been until now used as something of a dumping ground for random #ish. The JFNA says they were aware of the problem, or as I wrote on Jewcy: “They say they were aware of the No. 2 meaning of ish, and that their consultants told them that only about 7 or so folks hashtag #ish per day under the potty usage. Well. Watching the first week of the Twitter feed, it seems that the JFNA might have underestimated how territorial the original #ish-ers are of their hashtag. JFNA Tweeters during the first couple of days of the campaign actually seemed to overwhelm the original #ish-ers. But in recent days it seems the originals have mobilized. While JFNA seems to have weeded out non-Jew-#ish posts on the Whatisyourish.com site, on Twitter there seems to be just about a one-to-one ratio of those using the JFNA’s #ish vs those using the Urban Dictionary #ish. As we got this story ready for posting, we did a quick check on Twitter, and found that of the twenty most recent tweets that include #ish, only one relates to the Federation campaign, and all of the others use the term as street slang as in "gotta get my ish together" or "don't gimme any of that ish" or "it's so dark I can't see ish." This isn't the first time a company or organization made a naming choice that should have been more thoroughly researched before going public with it. There is an undocumented urban legend that Procter and Gamble found out when they test marketed their detergent named Dreck that it would have been a disaster because of the Yiddish meaning of the word and so they renamed it Dreft. 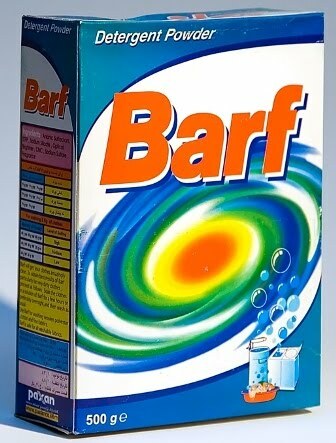 And there really is a laundry detergent named Barf that's sold in Iran and throughout the Middle East. It turns out that Barf means snow in Farsi, the primary language in Iran. So is there anything we can do to help the Federations out and turn this gaffe into a success story? There sure is. Just come up with a way to express your Jew-ish-ness and either post a Facebook note, a tweet, or upload a YouTube video to add your slant to this national campaign. Our tweet is going to be that we feel that part of being Jewish is having a sense of humor, or being humor-ish. To get you started, here's one of the first YouTube videos that the Federations posted. It's by the Sklar Brothers, feeling responsible-ish for everybody else-ish, and for the transgressions of every Jew, including Elliot Spitzer.